Oh! 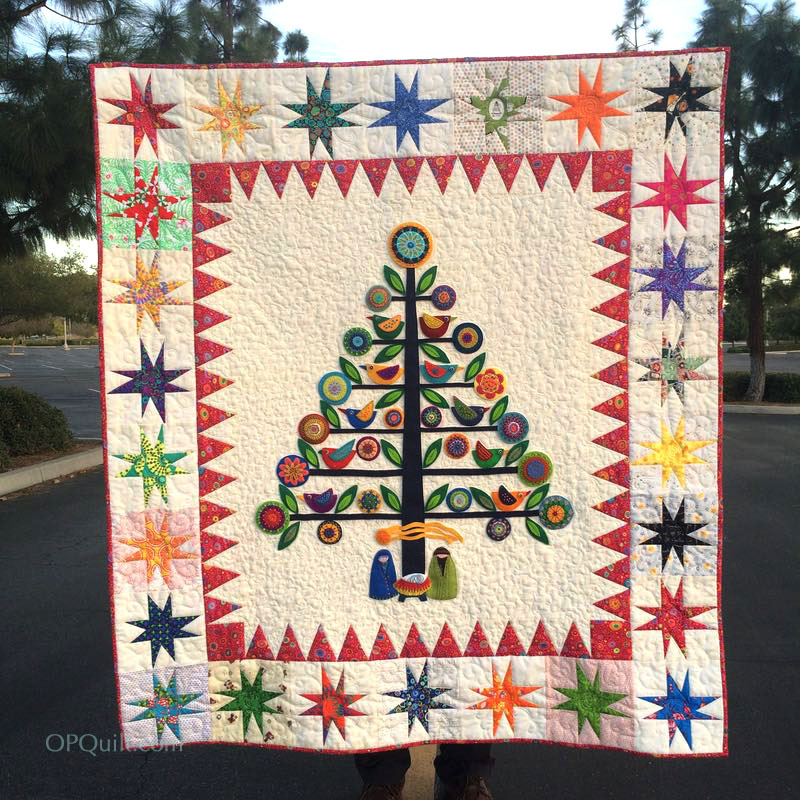 Christmas Tree Quilt | OccasionalPiece--Quilt! What a beautiful quilt. This is definitely on my list, my very loooong list. I love it! If you had asked me in March what I thought my comment would have been different but with each posting I was pulled along until now I want one, too. When I miss the evergreens, etc., I remind myself that asphalt doesn’t have to be shoveled. Even though I moved to CA 30 years ago I still remember listening to the weather report, setting my alarm earlier, and getting up to face a driveway full of snow and snowy, slippery roads on the way to work. Not willing to trade yet but I am looking forward to visiting family in NY over the holidays. I’m looking for some white stuff around the 25th, too. Thank you for sharing! Even though I traveled this road with you, with its fun and bumps, I remain in awe of your finish – it’s just perfect! 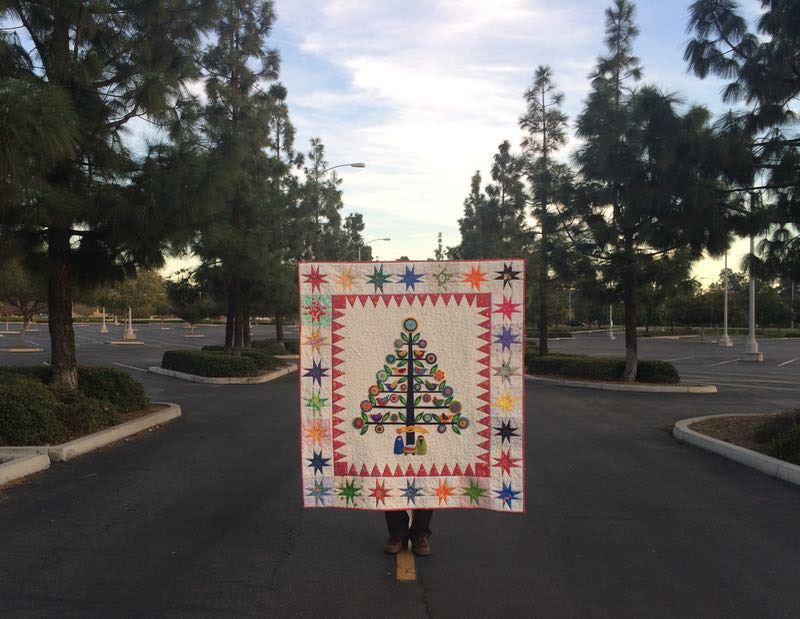 Besides your very special “under the tree”, I think my favorite part is how you finished the stars (and they were one of my favorite parts to work on). 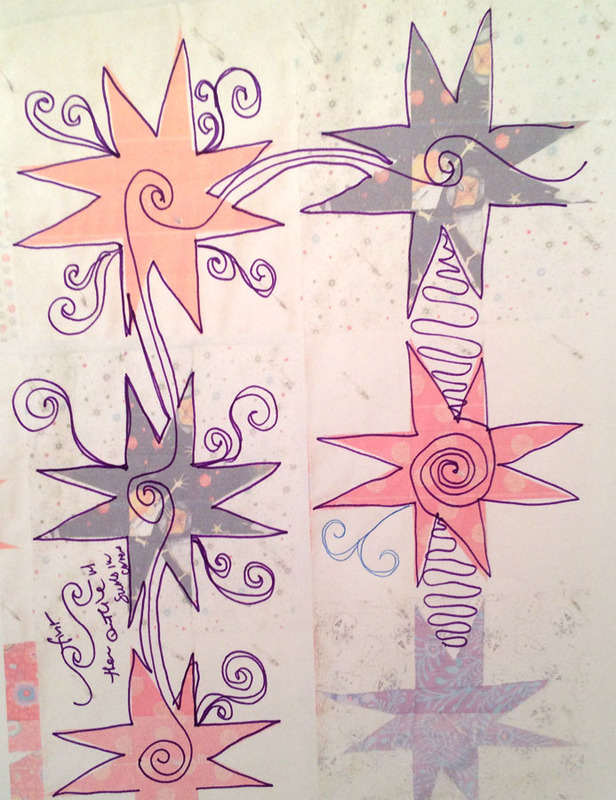 You did a great job with this QAL and I am most appreciative – thank you again! The asphalt background is “California fine”, along with your holder and “Paul Bunyon”. Your Christmas Tree is just delightful! You can always imagine you are living downunder where its Summer! No snow in my Christmas photos, that’s for sure! 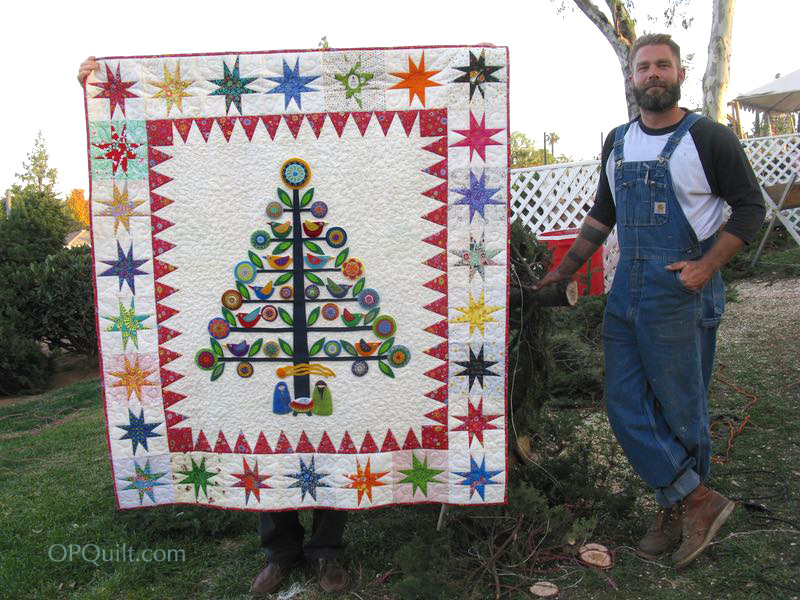 Love the look on the lumberjack’s face- priceless! The finish is fantastic. 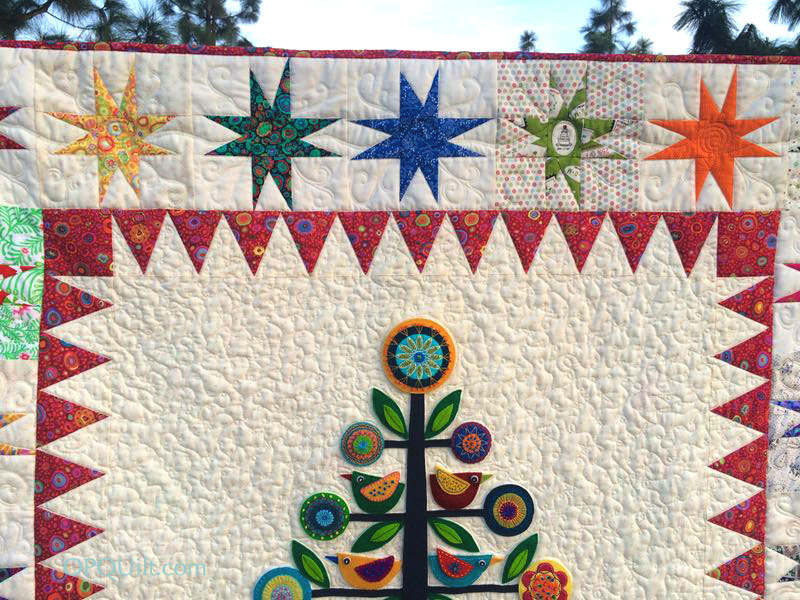 I love the way your quilting really brings the elements of the quilt to the forefront. (After all, that is why we call the background fabric “background”.). Beautiful work. Oh Elizabeth, it is beautiful! I love how some of the stars have a little light color in the background. The back panels are adorable too! I don’t know if mine will be done in time for Christmas. But once it is done, I should have no problem finding evergreens (or lumberjack looking guys, haha) here in Minnesota! lol Have a blessed Christmas! It is just plain lovely, Elizabeth and so evocative of the season. 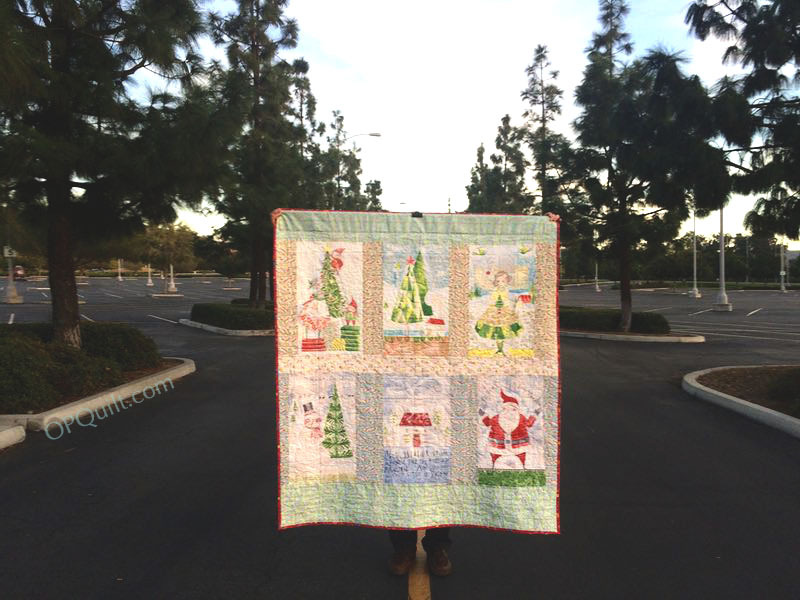 Your quilting decisions were perfect. A wonderful addition to your collection. 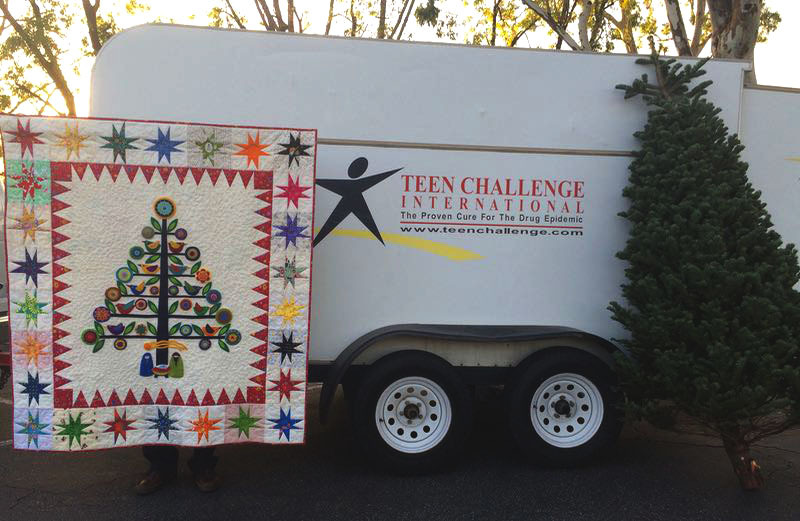 Your Christmas Tree quilt is amazing and I love that you included the nativity under the tree – perfect! Absolutely amazing. It’s been great following your blog as you worked on this. Absolutely stunning! You’re so talented!!! 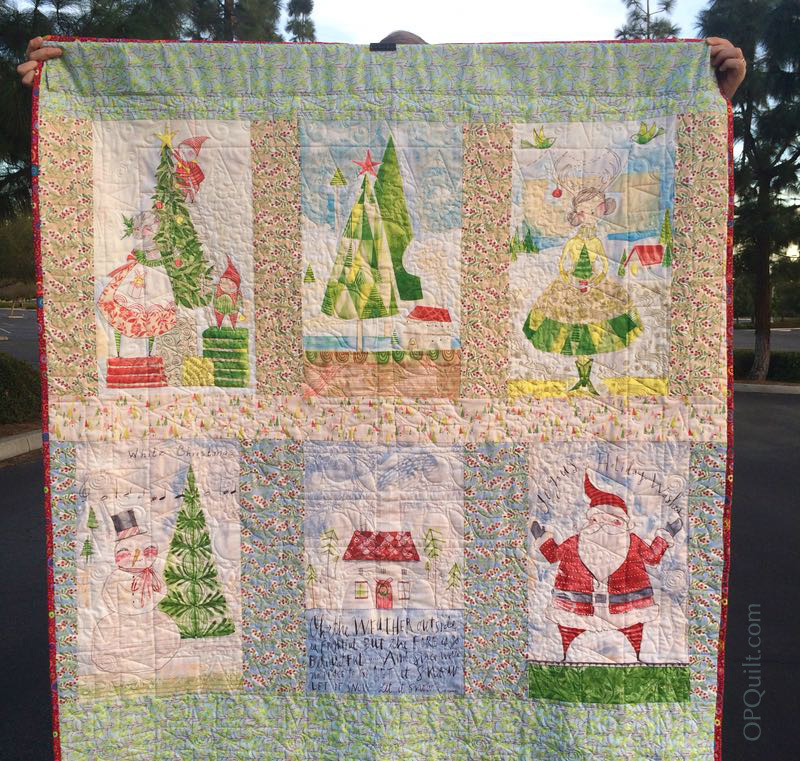 That quilt is absolutely a keepsake! You did a beautiful job. Oh Elizabeth, this is so beautiful! 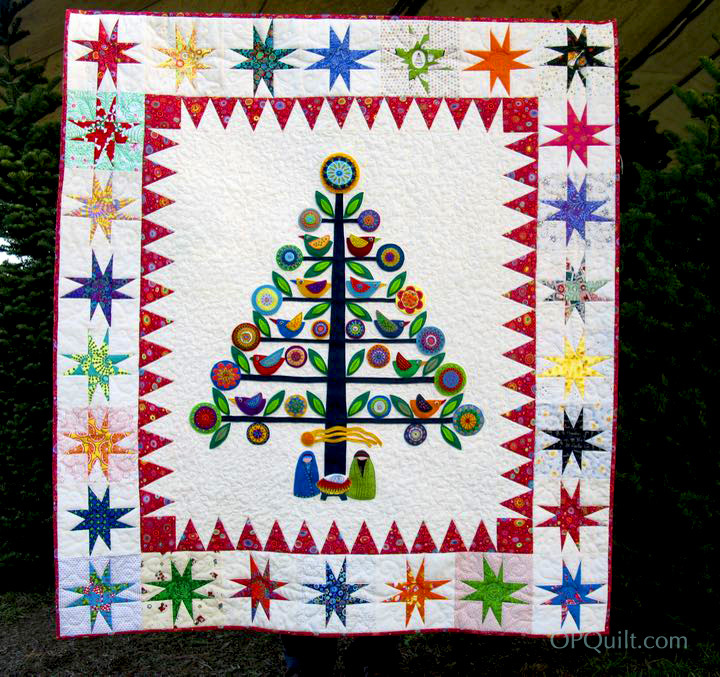 and the Kaffe stars and triangles are so perfect with the tree!. When I first saw you start on this I thought it was just the for a wall hanging. ! WOW! this is so inspiring. Fantastic! and bravo for Hubby! I love how you changed what is under the tree to a nativity scene. Even to someone non-religious like me, it seems like the perfect alteration. You are so clever! Another masterpiece. 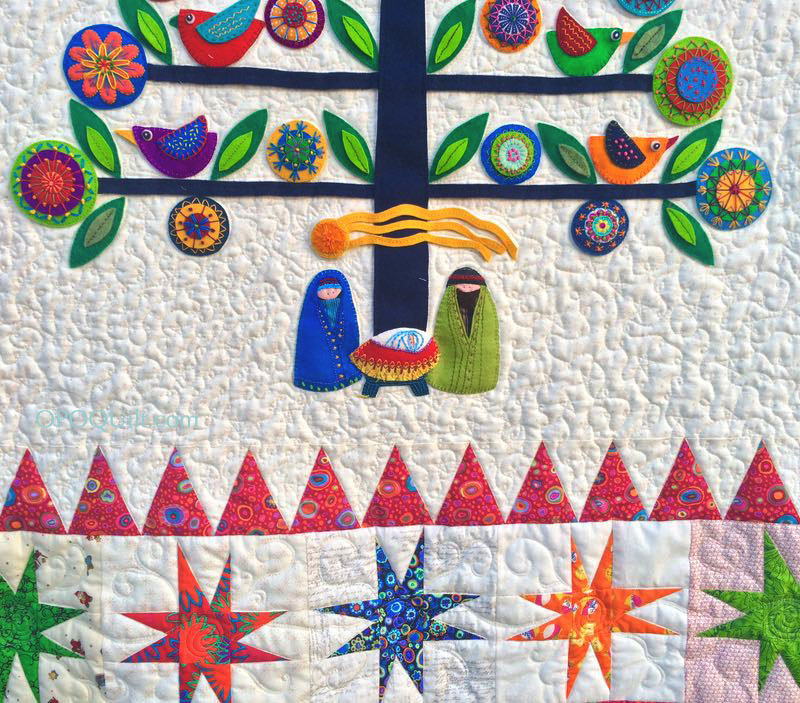 I adore this beautiful creation–so much to appreciate, from the swirling quilting, to the bird and flower tree decorations, to the tender family under the tree, to the nostalgic images on the back. I love it all. Lovely, lovely as usual. You always accomplish so much. Magnificent! The video-thoughtful. Thanks. ‘Tis the season. 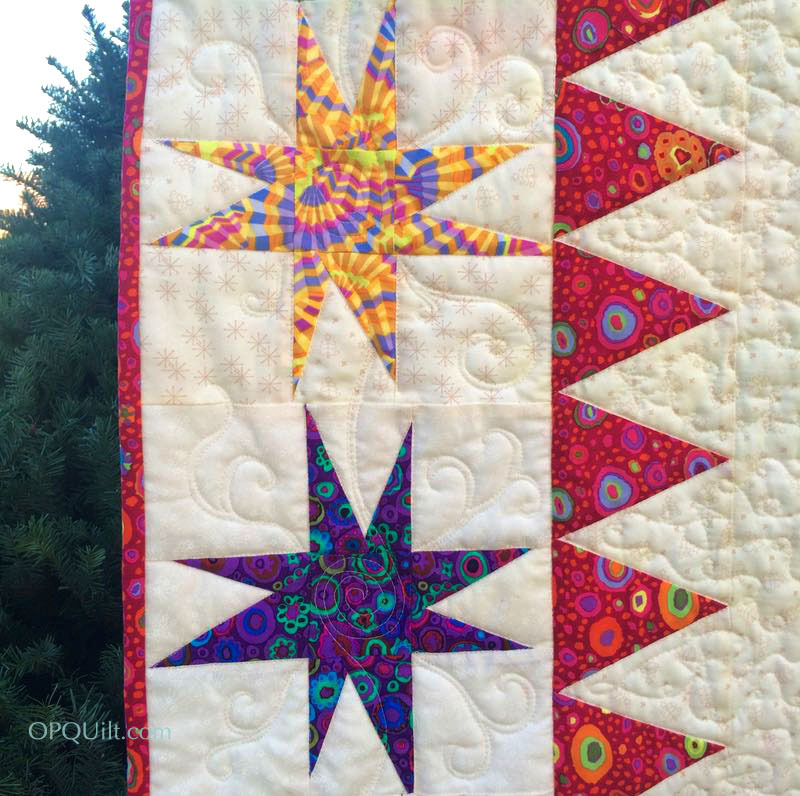 Pingback: Liberty USA Mini Quilt, 1 (along with some “slow quilting”) | OccasionalPiece--Quilt!